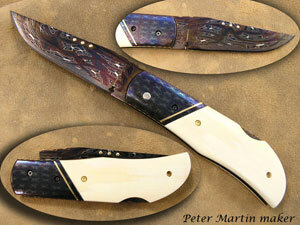 Here is one of Peter Martin's presentation grade lock back folders. The blade length is 3 7/16" and overall the length is 7 15/16". The blade and bolsters are Mosaic Damascus. The blade has 3 14K Gold dots, a 22K Gold blade stop, and 22K Gold wire inlay in the Mosaic Damascus bolsters. The scales are pre-ban Elephant Ivory. The back spacer is Damascus and is file worked. The liners are anodized and file worked on the top.